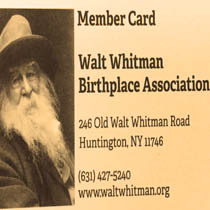 Free admission to Walt Whitman Birthplace and Interpretive Center. Annual subscription to Starting from Paumanok, WWBA’s seasonal newsletter. Free admission/substantial discounts for all programs held. Invitations to special events. 10% discount on museum shop purchases. 10% discount for site rentals for personal poetry readings or social events.